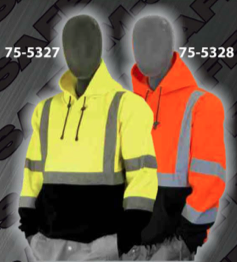 Looking to buy safety sweatshirts in Rochester NY, Ithaca NY, and Western NY at competitive prices & with exceptional service? The Duke Company proudly carries the finest Safety Sweatshirts – ANSI Class 3 Hooded, Pull-Over Sweatshirt in High Visibility Yellow and High Visibility Orange. Manufactured for important warmth in cool weather environments. Essential ribbed cuffs and waist keep the cold out. Sizes: Medium, Large, XL, 2 XL, 3 XL, 4 XL, 5 XL, 6 XL. 75-5327: Hooded, High Visibility Yellow with black contrast. Pull-Over. 75-5328: Hooded, High Visibility Orange with black contrast. Pull-Over.